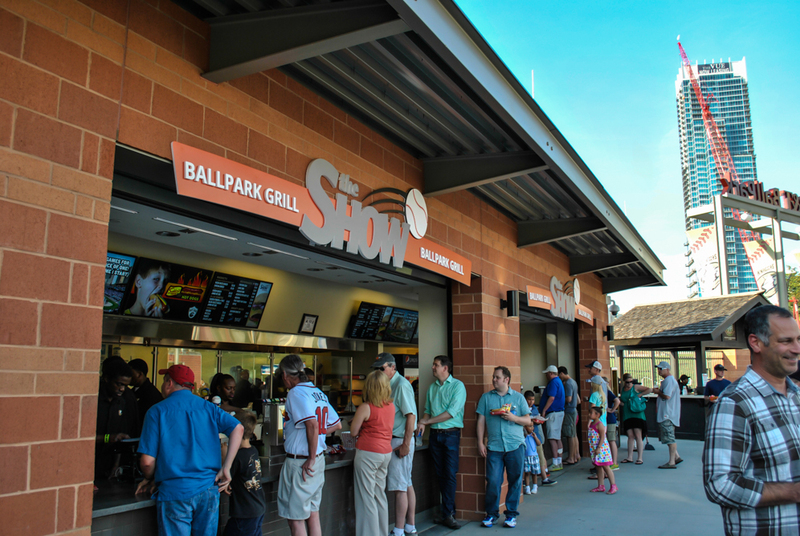 When we go out for an official burger review, we usually bring our equipment: tape measure, scale, fungo bats, etc. 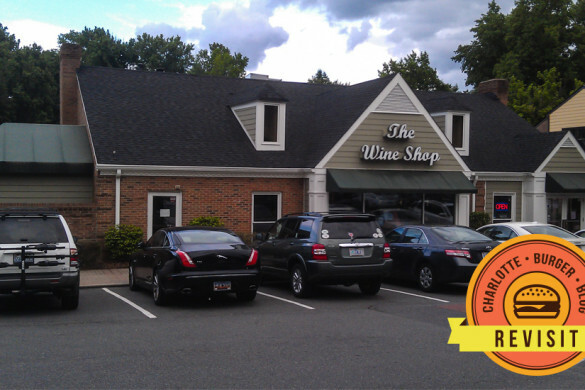 But we don’t just stick to our quest to eat every burger in Charlotte when we go out for reviews. 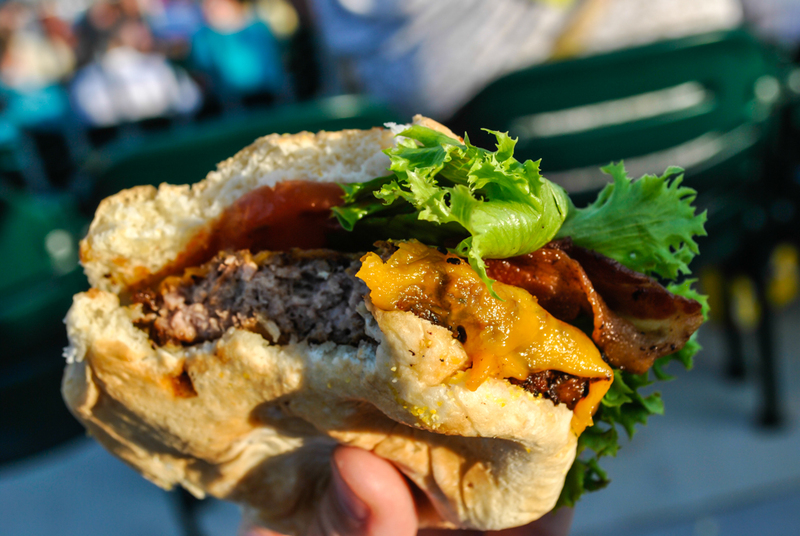 Sometimes we want to write a quick review of a burger that we just happened upon. We call these Short Orders. Wait, you’re running this review after the season is already over? Um, yes. I’m not proud. That said, there is still one more ball game that will be played there. 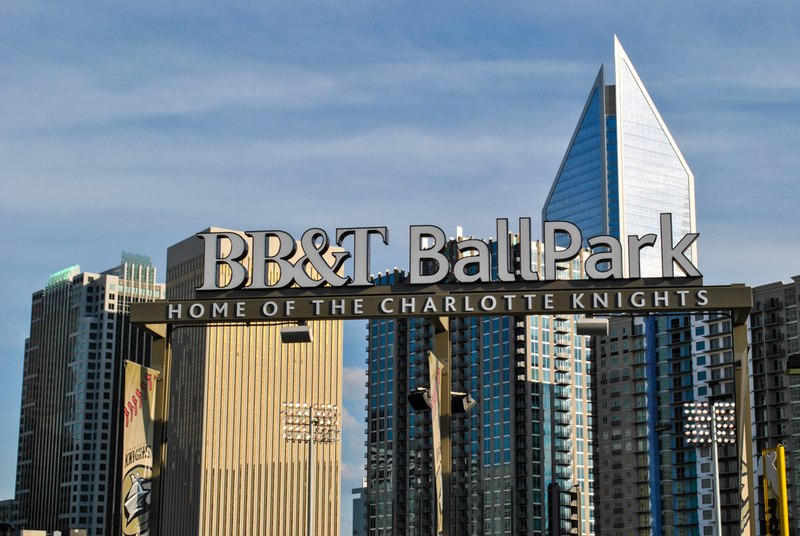 Charlotte will host the AAA Championship game on Tuesday, although the Knights won’t be in it 1. 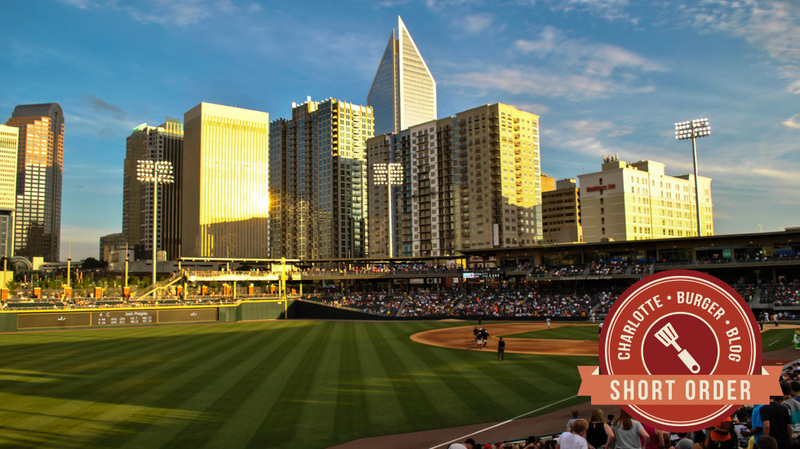 The Pawtucket Red Sox will play the winner of the series between the Reno Aces and the Omaha Stormchasers, so there’s still more baseball to be played in BB&T Ballpark! Fine. Well, tell me about the new ballpark. I probably don’t have to, because you probably already have been. Attendance has been amazing this year. 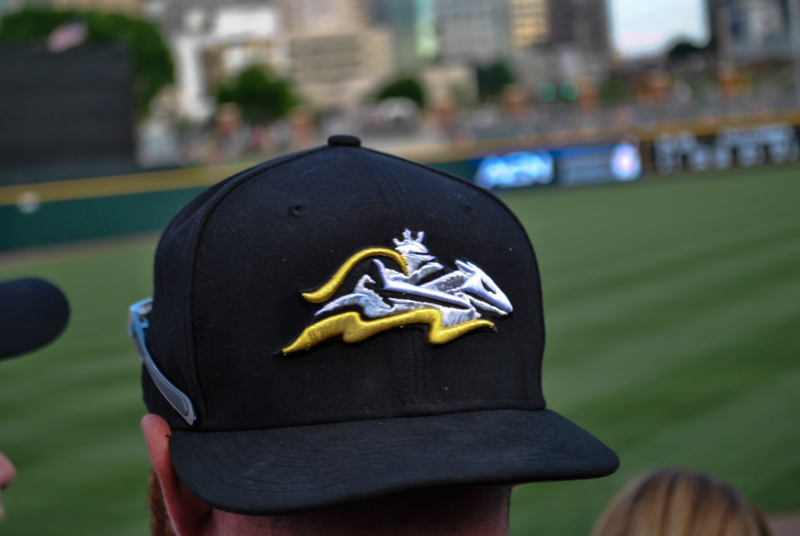 They broke the Knights all-time attendance record around the All-Star break, and they led AAA baseball in average attendance. What are the top ten things you love about the new park? 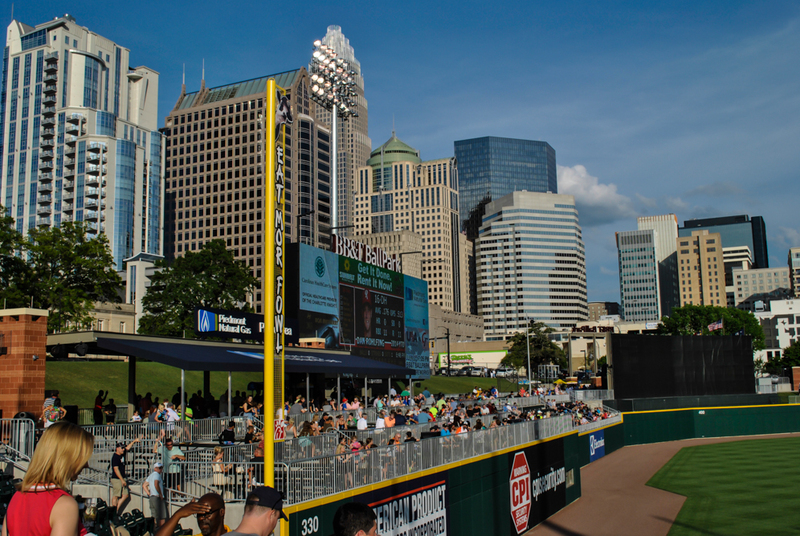 BB&T Ballpark sits among the skyscrapers in the downtown area, with the seats facing the center of town. There are many, many major league parks that don’t have a view like this. There were a lot of people who were worried about parking prices that might come along with the move uptown. If you’ve been to home Panthers games, you might be conditioned to expect prices to be around $20. That isn’t the case for the Knights. First, there are lots immediately across the street that only cost about $5. 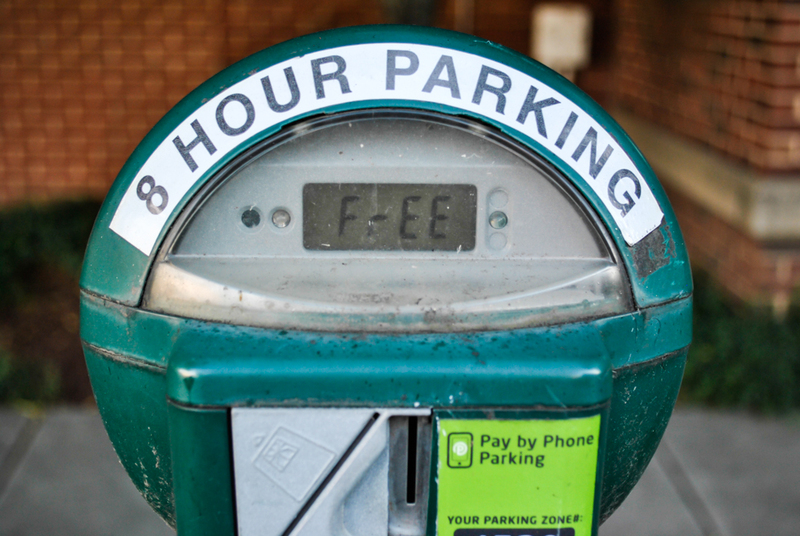 Or, you can park about 2 blocks away at a meter, which has the advantage of being turned off after 5:00 p.m. With the exception of a couple of weekday games, all of the games are after 7:00 or are on the weekends. I never paid to park to see the Knights, and I love that. And there are plenty of street spaces available. The old Knights stadium was, essentially, horseshoe shaped. The outfield wall was a barrier you couldn’t cross. The new BB&T ballpark has a 360° concourse that allows you to walk all the way around the park. 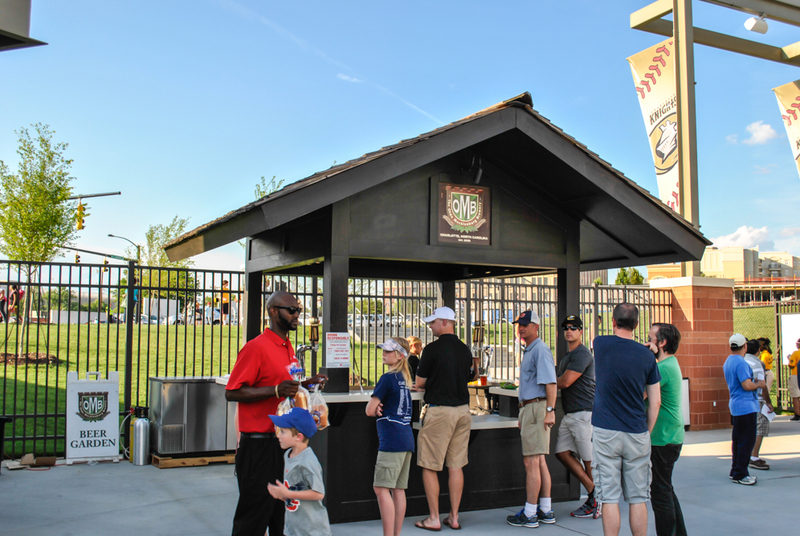 They have outfield seating, and a fantastic standing room only area called the Home Run Porch. And there are food vendors all around. 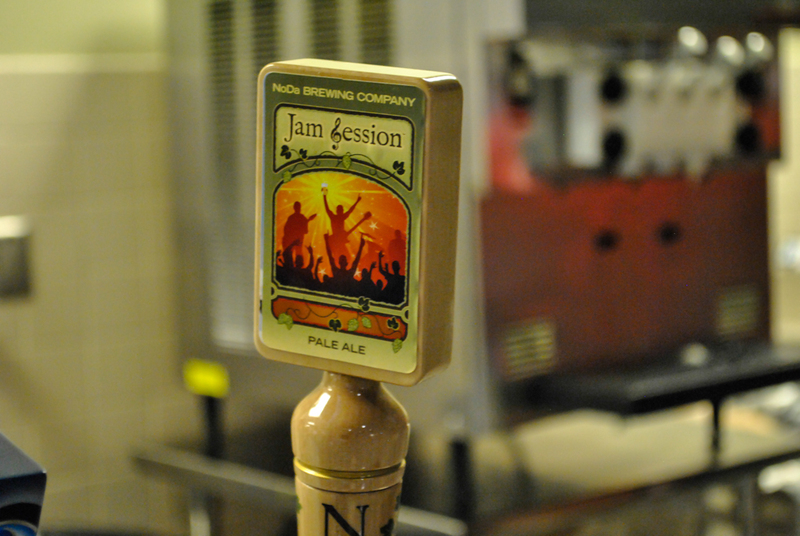 If you’re a fan of regional, craft beer there are a large number of options for you to try. 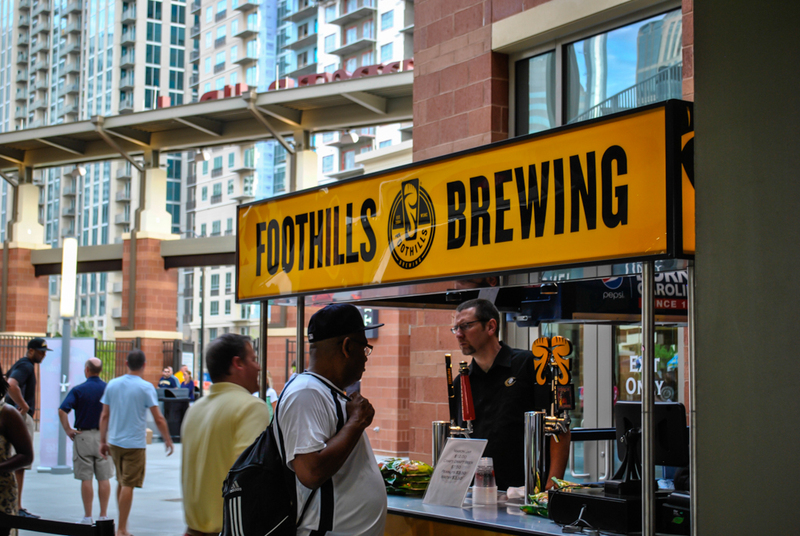 There are hometown favorites, like Old Mecklenburg Brewery and Noda Brewery (who has even has created a special brew for the park, The Knight’s Ale), as well other NC favorites like Natty Green’s and Foothills brewing. 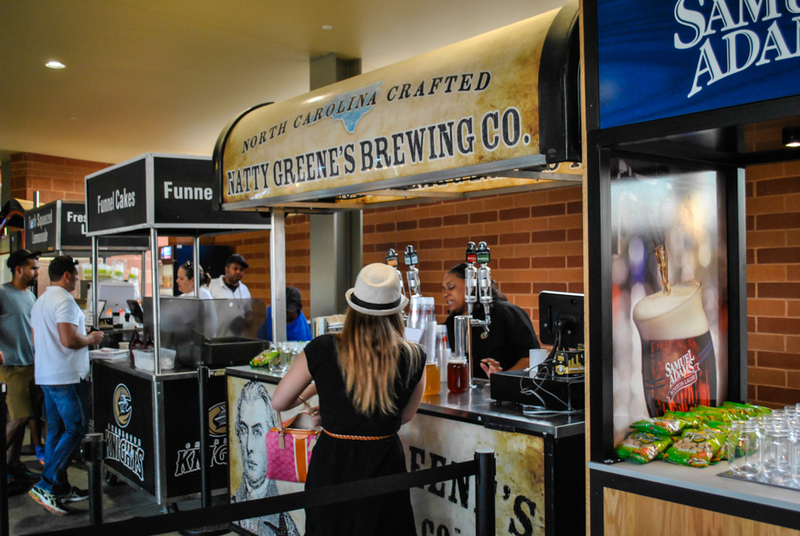 The beer is expensive (about $8 a cup), but that’s to be expected at a sports event. 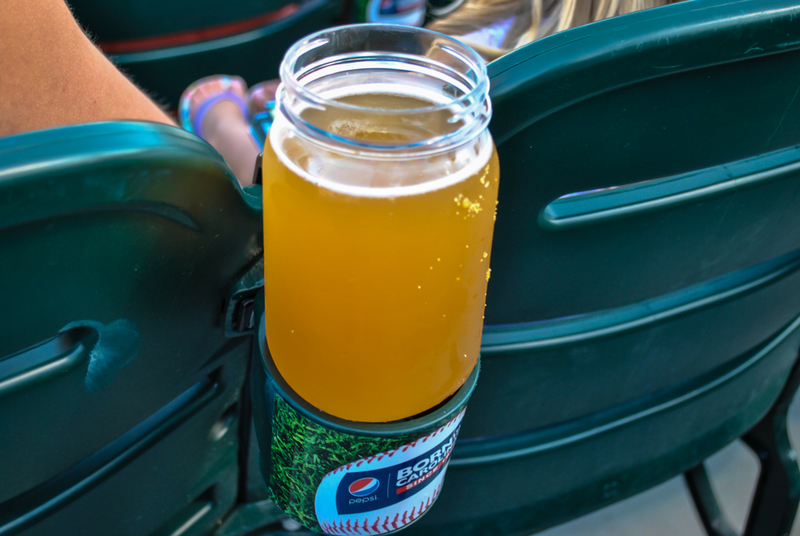 You pay a little more to get the Mason Jar option, which holds slightly more beer. Some people love Mason Jars. They do have the disadvantage, though, of not fitting in the cupholders. Seems like a design flaw. Somebody didn’t think this through. This is built to spill. Really, it’s spectacular. I have to mention it again. I’m still just a kid from a town that only counted 552 people in it in the last census, so I continue to get a sense of wonder walking through the city to go to the game. 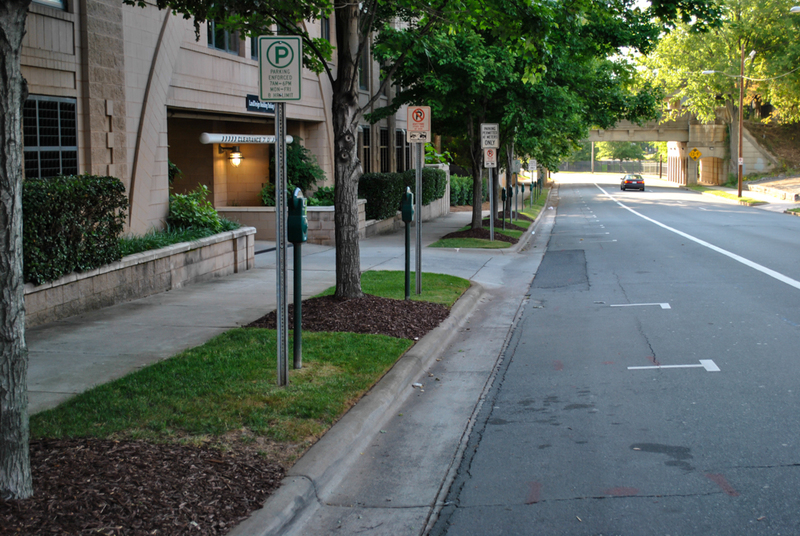 Charlotte doesn’t often seem like a city to me—sometimes it seems like a dense set of suburbs. But being in the city reminds me it’s the 16th largest city in the nation. I’ve already mentioned the attendance for the Knights this year, but the comparison must be made to last year’s attendance in Fort Mill. This is a picture we ran for our review of Knights Stadium which shows the number of people in the seats during the first pitch of the first game that year. It’s, honestly, pretty sad. We don’t have that problem anymore. Across the street from the ballpark is a nice, open green space named after Romare Bearden, the noted painter who was a Charlotte native. It’s a great place to hang out before the game. Where did you get your burger? I liked it quite a bit. It was well-done and somewhat dry, but to expect more at a sports game would be foolish. The bacon was amazing—floppy and tasty. 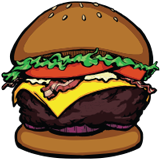 And they had a great slice of cheddar cheese melted over the burger providing a sharp contrast to the other flavors. 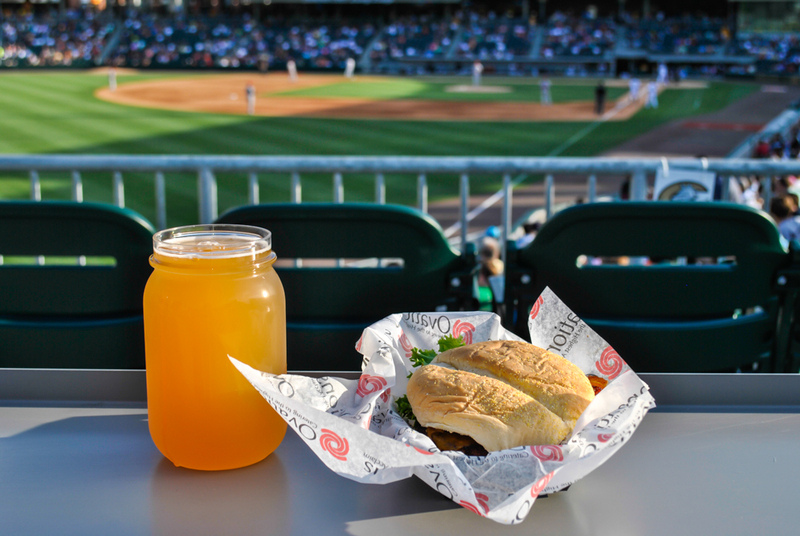 Speaking of contrasts, this is a FAR better burger than they had at the old Knights Stadium. That one was, frankly, insultingly bad, especially considering the price. I liked this burger, and would order one again. I should also note that condiments for the burgers are added by you, the customer, at the condiment bar across from the vendor. I like that, because that gives you the personal control to do whatever you want. You want relish on it—bam, you’ve got relish. You want BBQ sauce, there it is. You want to drown it in ketchup, that’s your prerogative. I don’t love it. 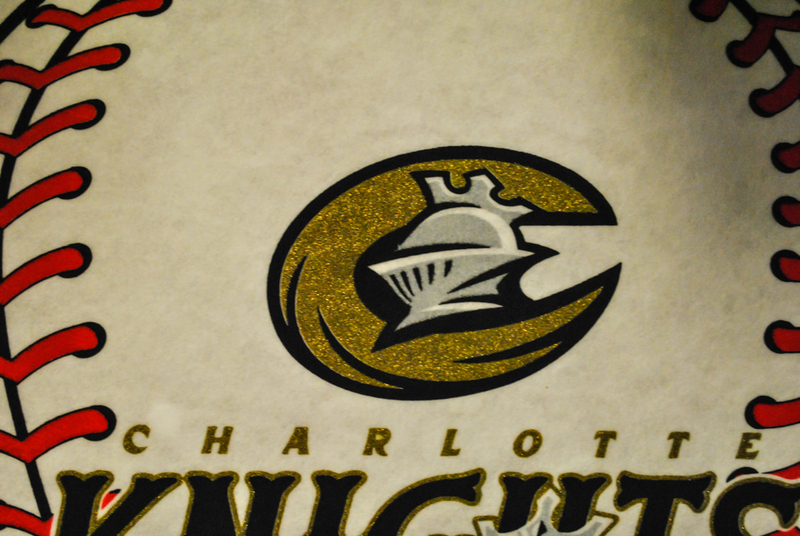 The old logo was one of the few things that I really liked about the Knights last year. This one feels more generic. 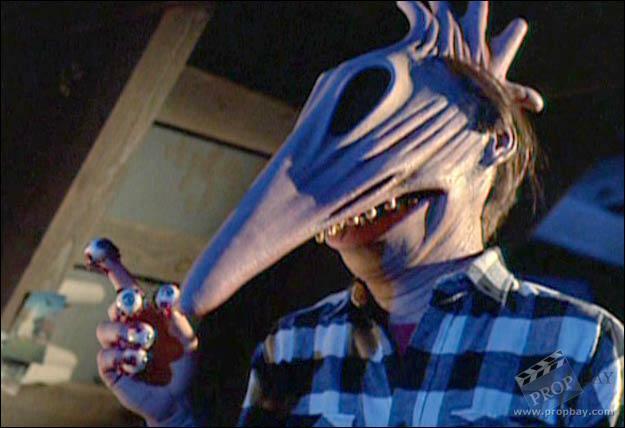 And the secondary logo looks like Alec Baldwin trying to scare Winona Ryder in Beetlejuice. Overall, I love this ballpark. It’s in a much better location, with much better fan support. 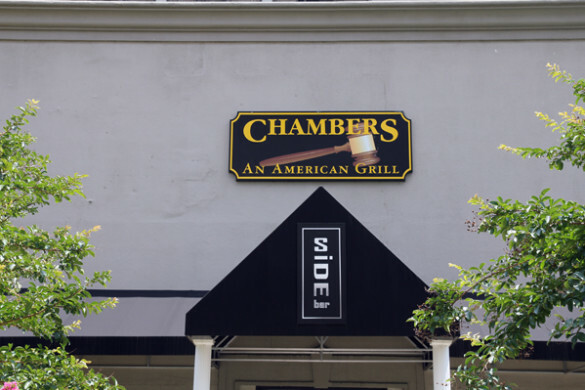 It’s a much better structure, and they have much better food. It’s everything I was hoping for when it was announced. I’m looking forward to another great season. 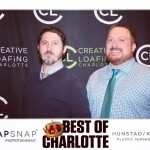 Matt has lived in Charlotte his entire life, and has loved baseball the same amount of time. I asked him to write a few words about what the move uptown has meant to him. Here’s what he had to say. 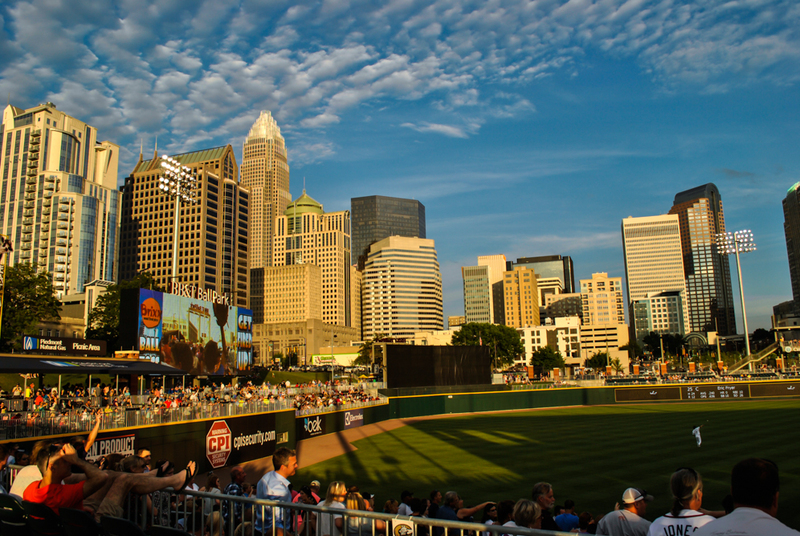 The Queen City has a long tradition of professional Minor League baseball, dating back as early as 1901. Charlotte had been an Independent (nonaffiliated with a Major League team) team until 1937 when they became a part of the Washington Senators (and later after relocating, the Minnesota Twins). The team was originally named the Hornets for most of its history until 1972. After a four year absence of baseball in Charlotte, the Baltimore Orioles’ Double A franchise moved from Asheville, NC in 1976 to become the Charlotte O’s. In 1988 after a change in ownership, the team was renamed to the Knights. Due to an unfortunate fire to their stadium, the team played the 1988 season at a temporary ballpark. 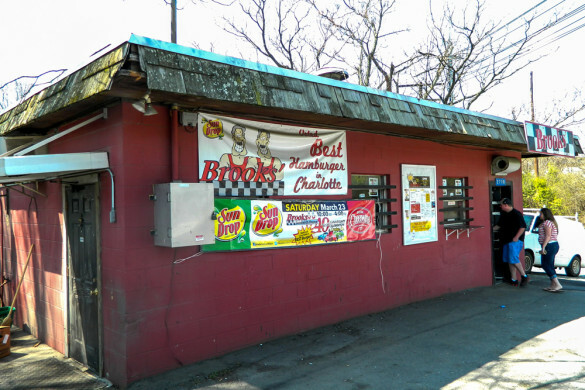 The following season the team moved to another temporary facility in Fort Mill, SC before a permanent park (Knights Castle) was built in 1990. I’ve been to a countless number of Knights games, both in their short stint in Charlotte and their 25 years in Fort Mill. 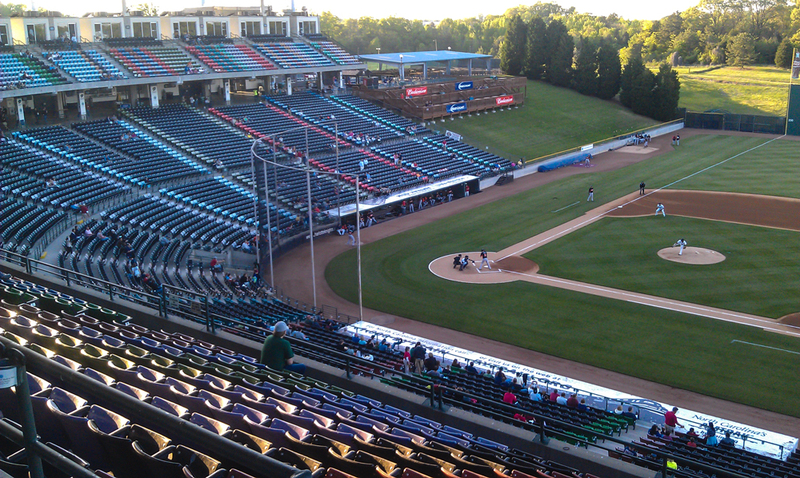 Despite the 40-45 minute trip south, I loyally followed the Knights after the move. I’ve bought many subpar hot dogs, over-priced beers, and a number of Knights t -shirts and ball caps. I fully supported my hometown team even if they didn’t played in my hometown. But one day I noticed something in their team store that I found very puzzling. 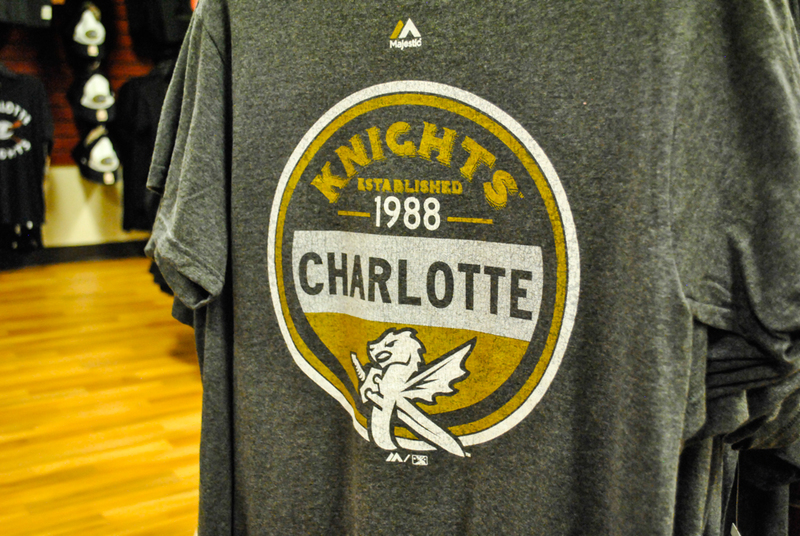 I saw several t-shirts and other Knights memorabilia with an establishment date of 1989, which was not the first year of the Knights, but the first year they played in Fort Mill. I found this very odd and went as far as going to their Facebook page and posting a picture of a program from 1988 which prominently showed the Knights logo and asked why they used 1989 as their start date. I never received a response. Some time later I asked the question again on the team’s official Twitter page. This time I did get a response, a short, unsatisfying “Yes, you are right”. Happily the team has now moved back to Charlotte. They have a beautiful new ballpark as well as a new logo and team colors. Magically, they also have a new established date! 1988 is proudly displayed on many Knights’ merchandise. I’m sure I had little to nothing to do with the change, but I do get a self-satisfying smile when I see Est. 1988.